It has always been a dream of mine to see New York City decorated for Christmas. There is so much to do, so much to see, and so much to eat in New York City year-round, but during the holidays, everything seems much more glamorous when it is lit up! I dreamt of standing under the famous Rockefeller Center Christmas tree as the snow fell as if I was a part of a Hallmark holiday movie. 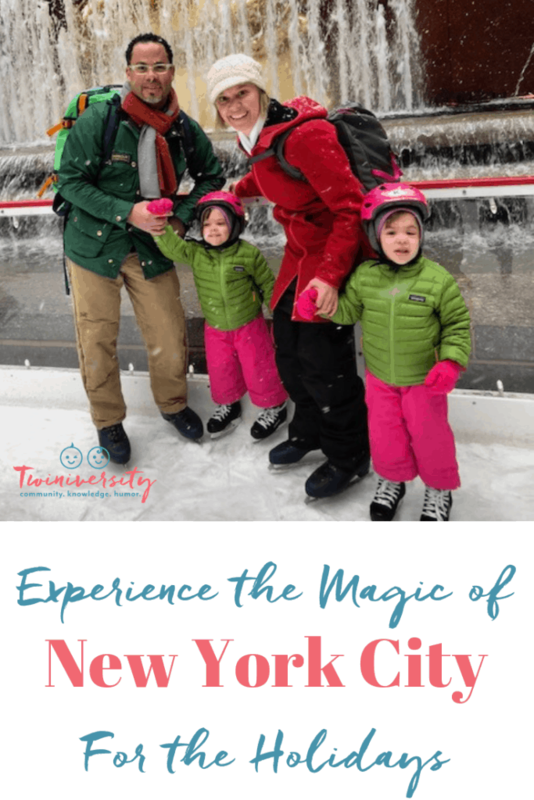 Taking twin preschoolers along to a busy city is never an easy task, but seeing the magic in my kids’ eyes really made this trip exceed all of my dreams of such a vacation. 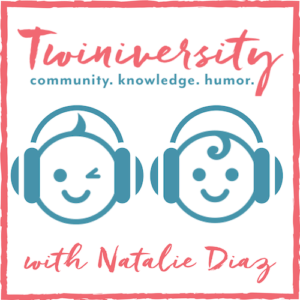 I highly recommend that you plan ahead…but not too much! The holidays should be fun, not stressful. Allow yourself plenty of time to get around from place to place and spend as much or a little time at each location that the kiddos will stand. While I can certainly understand the desire to do as much as possible during your vacation, keep in mind that it is cold and crowded so everyone may need some time to rest away from the hustle and bustle. You will want to take your time and enjoy the beautiful scenery without stressing about the crowds and long lines. Be sure to take into consideration any time change associated with your travel. Anytime we travel to the east coast from Denver, my girls tend to stay on the home schedule, so for us, we stay up later but end up sleeping in too. If you think it will be a later-than-normal night, try not to plan anything for the morning so that everyone can have a casual, quiet breakfast. It is also important to point out that sometimes the stroller just won’t work. I think it goes without saying that New York City is crowded…add the extra tourists and shoppers during the month of December and some areas are downright packed! Getting a stroller around may be next to impossible. 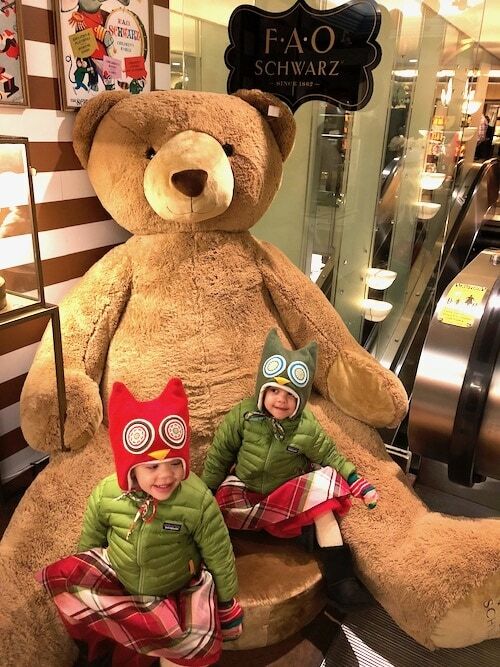 If you plan on heading to see the tree at Rockefeller Center, the famous window decorations at Saks Fifth Avenue, or want to do a little department store shopping, it is best if the stroller is left at the hotel. The stroller, especially a double, can also be difficult to manage while navigating the subway. Public transportation is definitely the cheapest way to get around the city, and getting to the proper platform in a timely fashion is done much easier with everyone on foot (or in your arms/carrier). The major item on my bucket list to do in New York City for the holidays was ice skating at Rockefeller Center, and I found that paying to skip the line is worth it! Yes, breakfast with Santa here will likely be the most expensive meal of the trip, maybe the most expensive breakfast of your life, but skipping the lines afterward and ice skating with Santa makes it a must-do! This was an event that required a bit of training considering I had never ice skated and neither did my 4-year-old twin girls, so months before our trip, we enrolled in weekly ice skating lessons near home. While this may not be necessary (we saw plenty of first-timers clinging to the wall), we wanted to make the most of our experience. On the day of our reservation, we were able to eat a delicious (and plentiful) breakfast, take pictures with Santa, rent ice skates and skate all while it appeared the line to ice skate alone never moved. The kids even walked away with a few treats from the man in red himself! Make sure you make this reservation online well in advance. Seeing Santa at Macy’s in Herald Square, where reservations can be made 5 days ahead of time for free on their website starting in November. Seeing a Broadway show is a must for anyone’s wish list, and many of those tickets go on sale and sell out months in advance so be sure to do your research for any family-friendly shows and get tickets as soon as possible. 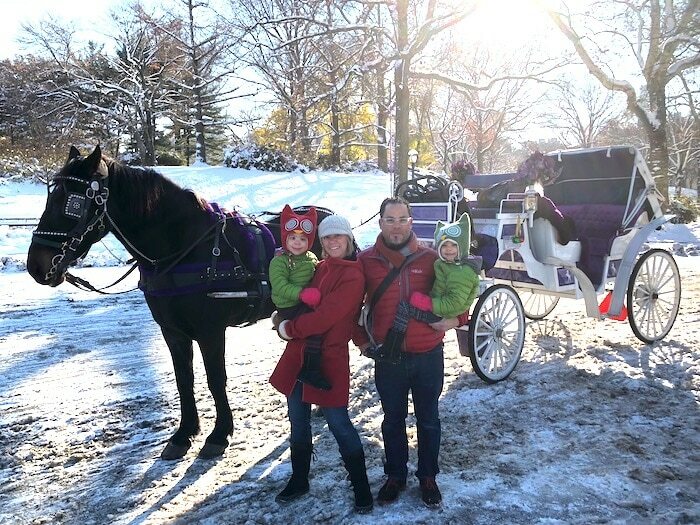 Taking a carriage ride thru Central Park is a great way to relax while still taking in the sites! You can book this in advance too by going to www.centralpark.com and choose your day, time, duration and even add on some extra magic or romance if you like. With so many places to eat in New York City, it’s really hard to go wrong, but consider booking dining reservations so you can ensure a nice place to eat for the entire family. Planning ahead will save you both time and disappointment. Perhaps the best thing to do is just take in all the holiday decor that the big city has to offer. Christmas is a magical time for children; allow them to use their imagination, and pretend you are Buddy the Elf looking for Christmas trees! Go warm up inside a museum like the Metropolitan Museum of Art or the Natural History Museum and search for the tree. Live like a New Yorker for a few days; choose a vacation rental rather than a hotel room and get your own mini tree from any number of street vendors to decorate your home away from home. 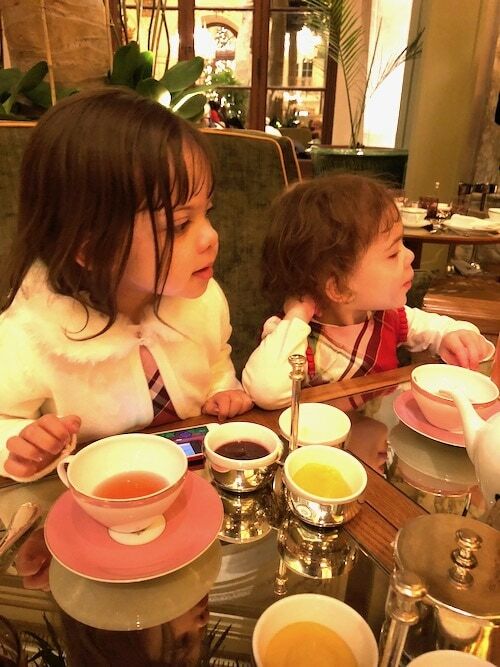 Get dressed up, and have afternoon tea at the Plaza before taking family photos in front of their beautifully decorated tree…the possibilities are endless. The holiday season is my favorite time of year. There is no doubt that travel can be stressful, given the crowds and winter weather, but I think there is something magical in standing under a towering Christmas tree covered in thousands of lights while snow is falling and you are ice skating or drinking hot chocolate in the middle of a bustling city. OK…again, I’m a sucker for a holiday Hallmark movie. 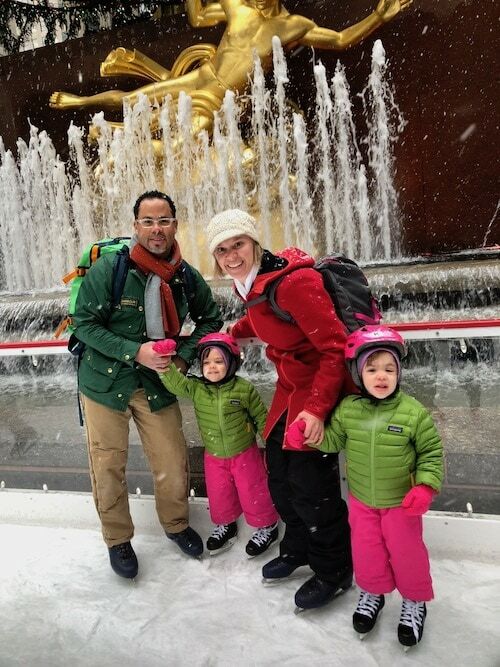 Being together and creating lasting memories with your family is really what the holidays are all about, and nothing make me happier than when my kids talk about the fun we had on our vacation. Mandy Sullivan attended Northern Illinois University for Kinesiology with emphasis in Athletic Training. 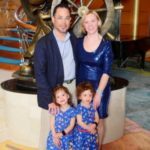 After working for years in a physical therapy office and traveling every chance she got, Mandy decided to leave the medical field and pursue her interest in food and travel. 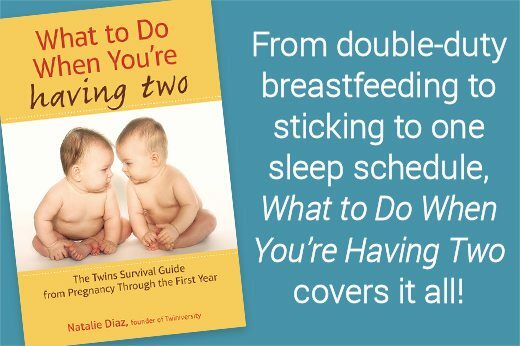 While the pace of travel and eating out may have changed now that she and her husband have 3 year-old twin girls, they still have fun seeing new places and trying new things. Check out her website and blog, on Facebook, Twitter, and Instagram. Should I bring my kids to see HELLO DOLLY on Broadway? 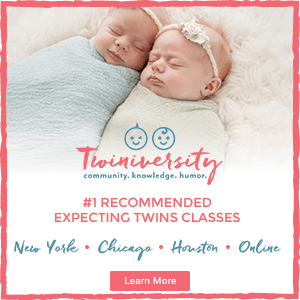 Should I Drive or Fly Home at Christmas with Baby Twins?